INPI (The French National Industrial Property Institute) has published a report, detailing the top 50 companies/institutions with the most patent applications published in 2017. Laurence Sekkat (2018), « Les palmarès de déposants de brevets », STATISTIQUES INPI, mars 2018. The number of filings from L’Oréal continue to drop with 269 in 2017, 55% of the number filed in 2011. I have prepared a summary, in English, of the section related to chemistry but the original source document remains the reference document. All figures are taken from the document with English text modified/added where appropriate. The report contains an analysis of the filings by 5 principle domains (Mechanical engineering, electrical engineering, chemistry, instruments and others) and 35 sub-domains following the list published by the World Intellectual Property Organisation. 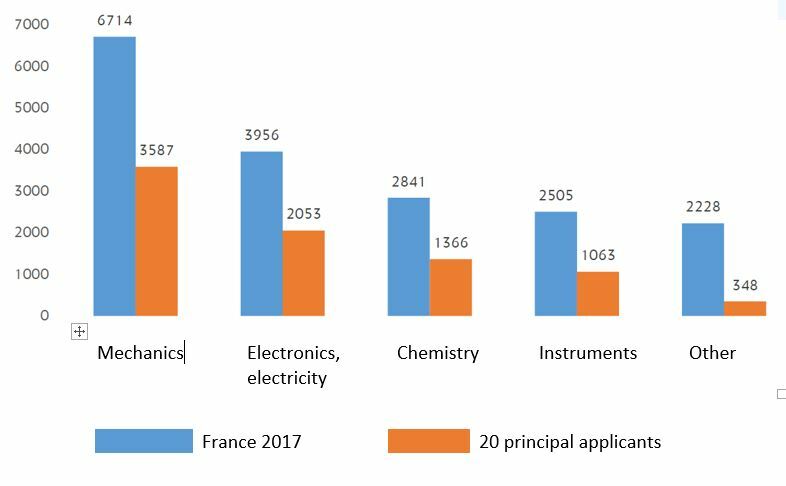 The largest component of others for patent applications published in France in 2017 is civil engineering. 53% of the patent applications published in 2017 were filed by the 20 principal applicants. Patent applications published in 2017 have been filed from July 1st 2015 to June 30th 2016. The six sub-domains for chemistry are organic fine chemicals, chemical engineering, base chemicals, macromolecular chemistry and polymers, pharmaceuticals and food chemistry. The 14995 patent applications published by l’INPI (national filings) in 2017 were analysed by the Derwent Innovation tool from Clarivate Analytics (https://clarivate.com/products/derwent-innovation/). An initial map was generated from key words associated with each patent application to delineate different technology domains. The peaks correspond to the highest concentration of patent applications. 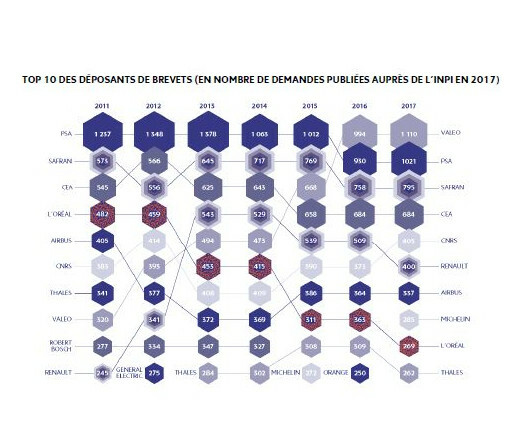 There are 21 principal domains, within which fall most French patent applications. The chart below shows the distribution of filings for the four principal applicants in the chemistry and cosmetics domain. The principal applicants are ranked according to the number of patent applications published by INPI in 2017. This is chart 3 in the original document. L’Oréal, in red, are concentrated in cosmetics, and some in packaging. 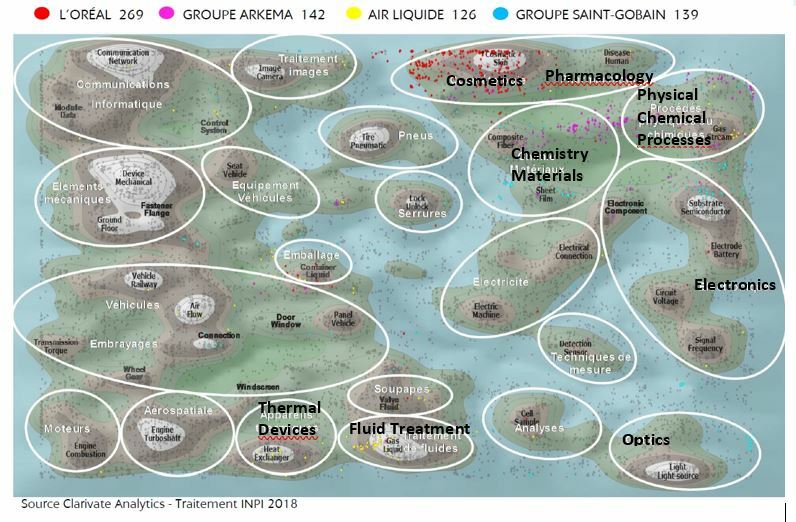 Groupe Arkema, in pink, are related to chemistry and materials, notably polymers, and to chemical processes. Air Liquide, in yellow, fall within thermal devices (heat exchangers) and fluid treatment domains. In particular the production and storage of gases and the physical and chemical processes related to the separation and purification of gases. Groupe Saint-Gobain, in light blue, are mostly related to glazing, vehicle windows, chemistry, electronics and optics. Two research organisations – IFP Energies Nouvelles and the CNRS – filed patent applications in the chemistry domain. These were treated in a separate map (map 6) of the INPI report.